The practical if not formal unification of England and Scotland under one ruler was an important shift of order for both nations, and would shape their existence to the present day. Another development of crucial significance was the foundation of the first British colonies on the North American continent, at Jamestown, Virginia in 1607, in Newfoundland in 1610, and at Plymouth Colony in Massachusetts in 1620, which laid the foundation for future British settlement and the eventual formation of both Canada and the United States of America. In 1609 the Parliament of Scotland began the Plantation of Ulster. A notable event of James' reign occurred on 5 November 1605. On that date, a group of English Catholics (including Guy Fawkes) attempted to assassinate the King and destroy Parliament in the Palace of Westminster. However, the Gunpowder Plot was exposed and prevented, and the convicted plotters were hanged, drawn, and quartered. The pragmatism of 'little by little' was coming to characterise his style of governance. At the same time, the curious combination of ability and complacency, idleness and shrewd judgement, warm emotions and lack of discretion so well described by Fontenay remained typical of James throughout his life. Political events and developments of the Jacobean era cannot be understood separately from the economic and financial situation. James was deeply in debt in Scotland, and after 1603 he inherited an English debt of £350,000 from Elizabeth. By 1608 the English debt had risen to £1,400,000 and was increasing by £140,000 annually. Through a crash program of selling off Royal demesnes, Lord Treasurer Robert Cecil reduced the debt to £300,000 and the annual deficit to £46,000 by 1610—but could not follow the same method of relief much farther. The result was a series of tense and often failed negotiations with Parliament for financial supports, a situation that deteriorated over the reigns of James and his son and heir Charles I until the crisis of the English Civil War. The Jacobean era ended with a severe economic depression in 1620–1626, complicated by a serious outbreak of bubonic plague in London in 1625. King James I was sincerely devoted to peace, not just for his three kingdoms but for Europe as a whole. He called himself "Rex Pacificus" ("King of peace.") He disliked Puritans and Jesuits alike because of their eagerness for warfare. Europe was deeply polarized, and on the verge of the massive Thirty Years' War (1618-1648), with the smaller established Protestant states facing the aggression of the larger Catholic empires. On assuming the throne, James made peace with Catholic Spain, and made it his policy to marry his daughter to the Spanish prince. The marriage of James' daughter Princess Elizabeth to Frederick V, Elector Palatine on 14 February 1613 was more than the social event of the era; the couple's union had important political and military implications. Across Europe, the German princes were banding together in the Union of German Protestant Princes, headquartered in Heidelberg, the capital of the Palatine. King James calculated that his daughter's marriage would give him diplomatic leverage among the Protestants. He thus would have a foot in both camps and be able to broker peaceful settlements. In his naïveté, he did not realize that both sides were playing him as a tool for their own goal of achieving destruction of the other side. The Catholics in Spain, as well as the Emperor Ferdinand II, the Vienna-based leader of the Habsburgs who controlled the Holy Roman Empire were both heavily influenced by the Catholic counter-Reformation. They had the goal of expelling Protestantism from their domains. Lord Buckingham, who increasingly was the actual ruler of Britain, wanted an alliance with Spain. Buckingham took Charles with him to Spain to woo the Princess. However, Spain's terms were that James must drop Britain’s anti-Catholic intolerance or no marriage. Buckingham and Charles were humiliated and Buckingham became the leader of the widespread British demand for a war against Spain. Meanwhile, the Protestant princes looked to Britain, since it was the strongest of all the Protestant countries, to give military support for their cause. His son-in-law and daughter became king and queen of Bohemia, which outraged Vienna. The Thirty Years' War began, as the Habsburg Emperor ousted the new king and queen of Bohemia, and massacred their followers. Catholic Bavaria then invaded the Palatine, and James’s son-in-law begged for James’s military intervention. James finally realized his policies had backfired and refused these pleas. He successfully kept Britain out of the European-wide war that proved so heavily devastating for three decades. James's backup plan was to marry his son Charles to a French Catholic princess, who would bring a handsome dowry. Parliament and the British people were strongly opposed to any Catholic marriage, were demanding immediate war with Spain, and strongly favored with the Protestant cause in Europe. James had alienated both elite and popular opinion in Britain, and Parliament was cutting back its financing. Historians credit James for pulling back from a major war at the last minute, and keeping Britain in peace. Frederick and Elizabeth's election as King and Queen of Bohemia in 1619, and the conflict that resulted, marked the beginning of the disastrous Thirty Years' War. 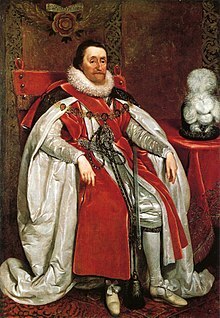 King James' determination to avoid involvement in the continental conflict, even during the "war fever" of 1623, appears in retrospect as one of the most significant, and most positive, aspects of his reign. In literature, some of Shakespeare's most prominent plays, including King Lear (1605), Macbeth (1606), and The Tempest (1610), were written during the reign of James I. Patronage came not just from James, but from James' wife Anne of Denmark. Also during this period were powerful works by John Webster, Thomas Middleton, John Ford and Ben Jonson. Ben Jonson also contributed to some of the era's best poetry, together with the Cavalier poets and John Donne. In prose, the most representative works are found in those of Francis Bacon and the King James Bible. In 1617 George Chapman completed his monumental translation of Homer's Iliad and Odyssey into English verse, which were the first ever complete translations of either poem, both central to the Western Canon, into the English language. The wildly popular tale of the Trojan War had until then been available to readers of English only in Medieval epic retellings such as Caxton's Recuyell of the Historyes of Troye. Jonson was also an important innovator in the specialised literary subgenre of the masque, which went through an intense development in the Jacobean era. His name is linked with that of Inigo Jones as co-developers of the literary and visual/technical aspects of this hybrid art. (For Jonson's masques, see: The Masque of Blackness, The Masque of Queens, etc.) The high costs of these spectacles, however, positioned the Stuarts far from the relative frugality of Elizabeth's reign, and alienated the middle classes and the Puritans with a prospect of waste and self-indulgent excess. Francis Bacon had a strong influence in the evolution of modern science, which was entering a key phase in this era, as the work of Johannes Kepler in Germany and Galileo Galilei in Italy brought the Copernican revolution to a new level of development. Bacon laid a foundation, and was a powerful and persuasive advocate, for objective inquiry about the natural world in place of the Medieval scholastic authoritarianism that still influenced the culture of British society in his lifetime. On practical rather than general levels, much work was being done in the areas of navigation, cartography, and surveying—John Widdowes' A Description of the World (1621) being one significant volume in this area—as well as in continuing William Gilbert's work on magnetism from the previous reign. Scholarship and the sciences, or "natural philosophy", had important royal patrons in this era—not so much in the King but in his son, Henry Frederick, Prince of Wales, and even his wife, Anne of Denmark (the Danish Court, from which she derived, had a strong patronage tradition in intellectual matters). The fine arts were dominated by foreign talent in the Jacobean era, as was true of the Tudor and Stuart periods in general. Daniel Mytens was the most prominent portrait painter during the reign of James, as Anthony van Dyck would be under the coming reign of his son. Yet the slow development of a native school of painting, which had made progress in the previous reign, continued under James, producing figures like Robert Peake the Elder (died 1619), William Larkin (fl. 1609–19), and Sir Nathaniel Bacon (1585–1627). Some would also claim, as part of this trend, Cornelius Johnson, or Cornelis Janssens van Ceulen, (1593–1661), born and trained in London and active through the first two Stuart reigns. The decorative arts — furniture, for example — became increasingly rich in color, detail, and design. Materials from other parts of the world, like mother-of-pearl, were now available by worldwide trade and were used as decoration. Even familiar materials, such as wood and silver, were worked more deeply in intricate and intensely three-dimensional designs. Architecture in the Jacobean era was a continuation of the Elizabethan style with increasing emphasis on classical elements like columns. European influences include France, Flanders, and Italy. Inigo Jones may be the most famous English architect of this period, with lasting contributions to classical public building style; some of his works include the Banqueting House in the Palace of Whitehall. St Paul’s Cathedral designed by Sir Christopher Wren in London. See also: Jacobean architecture. In the domain of customs, manners, and everyday life, the Jacobean era saw a distinctly religious tone. Virginia tobacco became popular. James I published his A Counterblaste to Tobacco in 1604, but the book had no discernible effect; by 1612, London had 7000 tobacconists and smoking houses. The Virginia colony survived because the English acquired the nicotine habit. ^ "Jacobean" is derived from Jacobus, the Ecclesiastical Latin form of the English name James. See "Jacobean". in Oxford Living Dictionaries. ^ Pauline Croft, King James (2003) p. 20. ^ Julian Goodare, "The debts of James VI of Scotland." Economic History Review 62.4 (2009): 926-952. ^ Melissa D. Aaron, Global Economics, Newark, DE, University of Delaware Press, 2020; pp. 83–4. ^ W. B. Patterson, "King James I and the Protestant cause in the crisis of 1618–22." Studies in Church History 18 (1982): 319-334. ^ G.M.D. Howat, Stuart and Cromwellian Foreign Policy (1974) pp 17-42. ^ Eliis Waterhouse, Painting in Britain 1530 to 1790, fourth edition, New York, Viking Penguin, 1978; pp. 42–66. ^ a b "Learn About Style: Jacobean". Victoria and Albert Museum. Retrieved 5 September 2012. ^ Cibelli, Dr. Deborah H. "Jacobean Architecture, 1603-25". The Arts and Architecture of the British Renaissance. Nicolls State University. Retrieved 5 September 2012. ^ Patrick Collinson, "Elizabethan and Jacobean puritanism as forms of popular religious culture." in Christopher Durston and Jacqueline Eales, eds. The Culture of English Puritanism, 1560–1700 (Macmillan Education UK, 1996) pp 32-57. ^ Churchill, Winston (2002). The Great Republic: A History of America. London: Cassell & Co. p. 27. ISBN 0-304-35792-8. Anderson, Roberta. "‘Well Disposed to the Affairs of Spain?’ James VI & I and the Propagandists: 1618–1624." British Catholic History 25.4 (2001): 613-635. Burgess, Glenn, Rowland Wymer, and Jason Lawrence, eds. The Accession of James I: historical and cultural consequences (Springer, 2016). Davies, Godfrey The Early Stuarts: 1603-1660 (2nd ed 1959), pp 1-80. Fincham, Kenneth, and Peter Lake. "The ecclesiastical policy of King James I." Journal of British Studies 24.2 (1985): 169-207. Fraser, Antonia. The gunpowder plot: Terror and faith in 1605 (Hachette UK, 2010). Houlbrooke, Ralph Anthony, ed. James VI and I: Ideas, Authority, and Government (Ashgate, 2006). Houston, S. J. James I (Routledge, 2014). Lee, Maurice. Great Britain's Solomon: James VI and I in his three kingdoms (U of Illinois Press, 1990). Lindquist, Eric N. "The Last Years of the First Earl of Salisbury, 1610–1612." Albion 18.1 (1986): 23-41. Lockyer, Roger. James VI and I (1998). Perry, Curtis. The Making of Jacobean Culture: James I and the Renegotiation of Elizabethan Literary Practice (Cambridge UP, 1997). Stilma, Astrid. A King Translated: The Writings of King James VI & I and their Interpretation in the Low Countries, 1593–1603 (Routledge, 2016). Waurechen, Sarah. "Imagined Polities, Failed Dreams, and the Beginnings of an Unacknowledged Britain: English Responses to James VI and I's Vision of Perfect Union." Journal of British Studies 52.3 (2013): 575-596. Lee, Maurice. "James I and the Historians: Not a Bad King After All?." Albion 16.2 (1984): 151-163. Underdown, David. "New ways and old in early Stuart history," in Richard Schlatter, ed., Recent views on British history: essays on historical writing since 1966 (Rutgers UP, 1984), pp 99-140. Wormald, Jenny. "James VI and I: Two Kings or One?" History 68#223 (1983), 187-209. Young, Michael B. "James VI and I: Time for a Reconsideration?" Journal of British Studies 51.3 (2012): 540-567. Akrigg, G. P. V., ed. Letters of King James VI & I (U of California Press, 1984). Coward, Barry and Peter Gaunt, eds. English Historical Documents, 1603–1660 (2011). Rhodes, Neil; Richards, Jennifer; Marshall, Joseph, eds. King James VI and I: Selected Writings (Ashgate, 2003). Science and Patronage in Early Modern England. "Jacobean Style Guide". British Galleries. Victoria and Albert Museum. Retrieved 16 July 2007.